Lately I’ve been allowing myself some more creative freedom, which is really refreshing. I’ve mentioned before trying to get away from the focus on a piece of work being ‘good’ and allow myself to just create. This week I’ve been working on part of my Children’s Illustration course that emphasises the use of texture, rather than solid outlines. I’ve been allowing myself to just go with my instinct and find I’m enjoying the act of creating much more than if I were worrying about how ‘good’ it should be. I’ve also been experimenting with decoupage during my one-to-one volunteering through the Alzheimer’s Society. I really feel that creativity can have a beneficial effect on people and can be very therapeutic. For me, combining music with creativity helps me experience what’s called ‘flow’ – when you’re utterly immersed in what you’re doing – especially with classical music. As someone who has experienced difficulties with my mood I can really appreciate the benefits of making creativity a regular part of life for individuals suffering from depression and anxiety. As well as art and crafts I used to write a lot of poetry, although the urge had left me for quite a while until the other day. I find writing poetry a good way of immediately letting out emotion and I’m happy to be inviting more forms of creativity back into my life. With Easter just around the corner this is the perfect excuse to let your creative self out! This month I’m showing you how to make your own spring decorations. These clay butterflies are super easy to make and would make a lovely handmade gift for someone. Take a chunk of each of your coloured clays and warm them between your hands until pliable. Roll your clay into a sausage shape and twist, working the clay until you get a marbled effect. Roll your clay out evenly using your rolling pin and place your cookie cutter over the clay, before pressing down firmly. Poke a hole in the top of your shape (depending on your shape you may need two) and thread some colourful embroidery thread or ribbon through and knot the ends. It’s official, spring is here, which means Easter is just on the horizon. Instead of chocolate or something mass produced, why not get something unique with the added benefit of supporting small business and creative individuals? I’ve been scouring Folksy and Etsy to find you some great Easter alternatives! I love this quirky brooch, which can be worn all year not just as Easter. This would be great for a loved one and arrives boxed. This was made in the UK by Ellen McCabe who runs Willowgifts on folksy. Her shop is well stocked with all sorts of ceramic gifts, from beautiful plant pots to unique buttons. More wonderful metalwork! This cute bunny is made using sterling silver and copper and is cut by hand. It comes in a gift box and a silver chain is included. You can find more unique jewellery in Silver Birch Studio online shop. Next week I’ll be bringing you some inspiration with my Spring craft tutorials, perfect if you want to give something specially made! If you had your heart set on something handmade this Mother’s Day but left it a little too late to order anything, why not try making your own? This month’s tutorial shows you how to make a simple decoration and is suitable for anyone who can use back-stitch. This can also be done on a sewing machine but I find it relaxing to work by hand. Pin inside your outline and cut out your shape. Separate your two pieces and position your embellishments where you’d like them before pinning into place and sewing. Place your two pieces together and pin into place, leaving a gap at the top to stuff/insert your embroidery thread or ribbon. Get bits of your stuffing and start filling your heart. If you want to you can add some essential oil. I used lavender. Carefully use a pencil to push the stuffing in and make sure it’s evenly distributed before sewing up the gap. This idea is highly adaptable. You can attach all sorts of things, even add beads for a bit of sparkle. Craft shops usually have ready-made shapes for you to buy so you can skip the delicate cutting out and get straight to the sewing. It’s been a couple of weeks since I’ve posted as I’ve been fighting off illness but I’m alive! And this week I’m bringing you some unique card and gift ideas for Mother’s day. As any regular readers of my blog will know, I love to promote other creatives and support small businesses, so all of my choices are handmade, making them extra special! This Folksy shop is run by Helen Wainwright who uses her artistic talent to make cards and prints. Her work is super cheerful, which is what I love most about her designs. Here are some of my favourite Mother’s day cards (click the picture for a direct link). Tina Martin designs and prints all her cards and has recently started stocking an eco-friendly range, offering 100% recycled cards/envelopes in biodegradable bags. Below are some of my favourite picks for Mother’s day but it’s well worth looking at the rest of Tina’s shop as you’ll find everything from prints and gift tags to painted stones and bookmarks. I’ve always loved glass work and Jessica’s shop is a treasure trove of beautiful gifts. There were two decorations that really caught my eye and I think the daffodil one would also make a wonderful Easter gift. This Etsy shop, run by Christine Layton is another must-see for glass lovers. I love Christine’s cards with little glass art keepsake! Next week I’ll be bringing you a quick last-minute handmade gift tutorial and as this is the time of year when my favourite flower is in bloom: the daffodil. I’ll leave you with the famous (and also my favourite!) Wordsworth poem. Recently my focus has been a bit all over the place when it comes to where to direct my creative energy. I’ve been dipping into my children’s illustration course then reviving old projects and feeling the need to work on those. Over a year ago I started an autobiographical piece that after a bereavement I felt unable to complete. I thought that that would be that, I’d never have the inclination to finish the piece as it reminded me of a difficult time in my life. However, the other day the urge to get back in to some….forgive me for this term….’serious’ art overwhelmed me. It’s been a little while since I did what people in my life know me for, which is more fine art (not including the still life we had to do for one of the units in my course). As some of you may know over the past year I’ve been turning my focus more to less precise work and embracing the freedom of illustration but I do miss that feeling I get when I get really engrossed in detail. I’m having mixed feelings about beginning work on this piece again but I have this feeling that right now I’m supposed to be out-letting some emotion with it. The other project I’ve brought out again is one I worked on years ago after the loss of my beautiful Springer Spaniel. Wanting to create something good from something bad I used the box her ashes came in to create a piece of work that had meaning behind it. I called it ‘The Fairy House’, but in a way it’s like a memorial piece. A lot of the materials I used represent something meaningful. In addition to the box that made the main structure of the house I used twigs collected from places I visited regularly with my dog. The field I used to walk in with my Nan (who has also now passed), moss which I dried from places we’d also walked, and even the shells on the roof have their own story. Many years ago on freecycle someone was advertising a box of craft materials that had belonged to their late wife. They wanted them to go to good use as his wife had spent many hours enjoying crafting with them. I promised they would and so they became part of the Fairy House. Some of the elements are handmade too; I used polymer clay to make tiny mushrooms that are ‘growing’ out of the roof, the blanket in the shell bed was knitted and the little pillow was a section of an old teatowel that I embroidered. A lot of work went into this project, yet for the past year the Fairy House has been sat in a shed. Now feels like the time to tidy it up a bit and decide where it belongs. I’m enjoying my volunteering with the Alzheimer’s Society and am incorporating my love of craft and all things creative into the session I’m doing. I feel like getting creative can have a positive effect on our wellbeing, even if only for the time we’re doing it. I’m yet to visit the Da Vinci exhibition in Cardiff (I mentioned in my last blog about the nation-wide exhibitions that were being held to mark the 500th anniversary of his death) but as it’s running until the beginning of May there’s still plenty of time to get there. Since I started researching the Italian Renaissance during my A levels (13 years ago) I’ve had an interest in the subject and artists from that time. I love the use of symbolism and considered using this era in my dissertation but opted for the Symbolist Movement (late 19th century)…you can see why. This week I’m allowing myself to just be creative in whatever way I feel. How much I create and how much I engage with my work is often dependent on how I’m feeling. This week I’m feeling in need of some freedom, to outlet emotions with whatever project feels right at the time. For those of you not from Wales you still may have heard of St David’s Day but not know much about it. Saint David’s Day is the feast of Saint David, patron Saint of Wales, and is celebrated on the 1st March as this is the day he’s said to have died in 589 AD. Today we mark the occasion in different ways, including wearing our national emblems the leek and the daffodil. Schools often hold concerts and special assemblies and I remember being so excited to wear my traditional Welsh lady outfit to school. As this special day is coming up soon, I’m dedicating this month’s creative tutorial to it and will be showing you how to make a decorative pinwheel daffodil. I got the idea from when I helped out at a children’s summer art school where we made paper summer flowers and have adapted it to fit this specific occasion. Start by cutting out two squares from your papers. I cut mine to 10x10cm but you can make them larger or smaller depending on how big you want your pinwheel. Draw a line from corner to corner on each piece of paper and mark 2cm from the centre on each line. Cut from the edge up to the 2cm mark and stick the lighter paper on to the darker paper using glue dots. Now you need to start folding your edges over. Start at the top and alternate. You need to bend to the right and stick the end with a glue dot until you have the shape below. Make a hole through your pin wheel and secure with a split pin. Take your wire and cut to the desired length. You can get coloured wire or you can jazz up plain wire by wrapping floral tape around it and adding some beads. Leave a little of the end unwrapped so you can push it into the ground. Attach to the back of your pinwheel using tape. Use all purpose glue to attach your button to cover the split pin. This step is optional but I like the look it gives. These pinwheels are decorative so don’t spin, but they look beautiful placed in plant pots. You can get creative with your pinwheels and add glitter glue or use any colour paper you want. All the materials used for this tutorial are available in Hobbycraft. This month I’ve been talking a lot about perspective with this month’s review being the book ‘Perspective & Composition’ by Barrington Barber (you can read it here). I’ve been continuing my learning curve with practising using the 1-point and 2-point perspective method and looking up examples of good perspective artwork. I found this youtube video to be particularly good in clearly explaining the method (click to open new window): ‘How to Draw in Perspective for Beginners‘. Youtube can be a great resource for art enthusiasts, particularly those who are teaching themselves. I’ve been a member of the website DeviantArt for a while now (my first account was set up in 2006!) and I’ve always found it an inspiring place as you get to see other’s art work and browse whatever topic takes your fancy. This past week I’ve been taking a look at ‘perspective’ and here are some pieces that really caught my eye, some because they clearly show the use of perspective lines. Click the names to be taken to the profile. I like how this piece is a mix of imagination and theory. You can clearly see this is an exercise in perspective and can see the 2-point perspective lines. In the book I reviewed last week there were various examples of where perspective can be used. The human body was briefly covered and this is an example by EpHyGeNiA. I love this piece as it’s so interesting. I think it’s a great example of an interesting perspective but I think it’s made so much more than that by the inclusion of the pigeons. Next week I’ll be bringing you a special St David’s day tutorial and I’m excited to say that soon I’ll be visiting the Leonardo da Vinci exhibition: ‘Leonardo da Vinci: A Life in Drawing‘ to mark the 500th anniversary of the famous artist’s death. Last week I talked a bit about the online art course I’ve started and how one unit had been focusing on perspective (link). 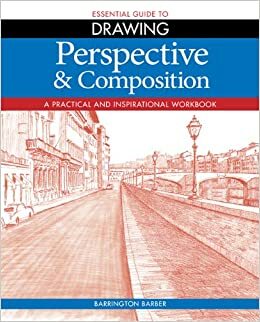 The unit prompted me to dig a bit deeper into the subject and today I’ll be reviewing the book ‘Perspective & Composition’. About: An instructional guide to the ‘rules’ of perspective and composition, with step-by-step exercises. I first came across Barrington Barber’s instructional drawing books when I was a teenager and used to lap up the art books in The Works. Although this particular book claims to be ‘practical and inspirational’ I’d argue that the former is at least true! As someone who loves step-by-step instructions both written and with visuals, I do like Barber’s books. However, this more methodical, instructional tone doesn’t exactly get you fired up with creative ideas. The covers of Barber’s books tend to be quite tame with a ‘school’ vibe about them and the interior looks almost text-booky. However, the contents is quality. The layout is logical, with a clear font, sub-titles and diagrams so is good for all kinds of learners, be they visual or more text-based. There are also mini projects throughout to ensure you understand the concepts being explained so there’s a good balance of theory and practical. I think this book would be best suited to art students, particularly around GCSE and would be useful in a classroom or tuition setting. Although, it would also be useful for those teaching themselves. One section mentions ‘Compositions by Master Artists’, which could potentially encourage further research and study. Another thing I like about this book is that although it’s short it tries to keep the users interest by covering different ways of using perspective, for example when drawing people or objects in addition to just landscapes and scenes. Although this book wouldn’t encourage me to purposely seek out any more of Barber’s books I did take something away from it and it’s worth a read if you’re really struggling with the concept of perspective. For me, the best way to learn about perspective is to practice, practice, practice and learn to trust your eyes; draw what you see, not what you think you should see.